Neem is well known for its medicinal properties. It has been used in Ayurveda since a long time. Every part of the neem tree including bark, leaves, fruits, roots, flowers is beneficial to our health. Neem flower has many medicinal properties.The flowers are used in treating intestinal worms. They are said to purify blood and remove toxins from the body. It has the ability to improve the immune system. It also has cooling properties.The flowers can be dried and stored for many months. Though neem flower has a bitter taste, this rasam will be very delicious and you will not feel the bitterness. 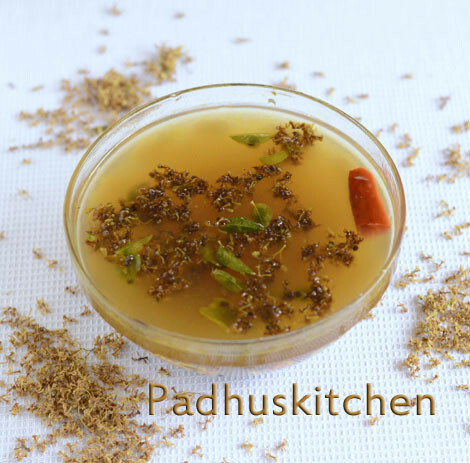 In India, it is easily available everywhere.This rasam is usually prepared during Tamil New Year. When this humble neem flower has so much health benefits, why not include it in our diet at least once in a fortnight. Soak tamarind in 1 1/2 cup warm water and extract it juice. Discard the pulp. Take tamarind water in a vessel, add tur dal (uncooked), hing, turmeric powder, salt and curry leaves. Heat 1/4 tsp of oil and fry the red chillies and add to the above. Now boil the tamarind water with all the ingredients on low flame until the raw flavor of the tamarind goes. Then add 1 3/4 - 2 cups of water or thin dal water, jaggery and heat until froth starts forming at the top. Do not boil the rasam. Switch off the flame. Heat 1 tsp of ghee, add mustard seeds, when it splutters, add curry leaves and pour it over the rasam. Heat another tsp of ghee and fry the neem flower on low flame until they turn reddish brown. (Do not burn the flowers). Now add the fried neem flowers to the rasam. Garnish with finely chopped coriander leaves. Serve hot with steamed rice or just have it as a medicinal soup. Super delicious !! looks so inviting !! Healthy rasam,seriously love it very much,eventhough everyone at home hate it to the core. Healthy and simple too, right up my street, thanks. Padhu, my Tamilian neighbour had taught us another way of eating these flowers. Take little ghee warm it, add about half spoon veypam poo and fry for a few seconds. Add this flower to hot cooked rice add little salt and eat it. I believe it relieves you of all the worms in the stomach. Thanks for this recipe!! I remember my grandma making it when i was a kid and now when i wanted to know how to make it for my husband, i found it here!! Love the way you simplify these age old recipes!! Nice Useful receipe.. Thank u..
Is the dal uncooked? How it will come out? It will get cooked.It is just 1 tsp of dal. I got a doubt....When should I add jaggary ? I have written under Method - 4 th line. While adding diluted dal water.